Незрячий глаз это валюта, которая фармится с НПС в Клоаке Даларана (Расколотые острова). Кроме того, Незрячий глаз можно найти в Раздутый пожиратель стоков, который вылавливается в Стоках Даларана, а также в различных сундуках спрятанных там же в Стоках. Чтобы получить достижение Невиданный урожай и маунта Крысоконь, Вам нужно будет в общей сложности собрать 20000 Незрячий глаз. Сразу хочу успокоить, при максимальном количестве хранимых Незрячий глаз в 5000, для достижения учитывается общее количество полученных за всё время Незрячий глаз на конкретном персонаже. Незрячий глаз можно смело тратить. Временной альтернативой маунту Крысоконь является Ящик с упряжью для крысоконей, который продаётся у Ретан за 950хНезрячий глаз и содержит в себе 25хУпряжь крысоконя. 2)Ждём рарника и идём вместе бить с другими игроками, либо просто в большое скопление игроков. 4)Прожимаемся и сдаём аое атаки. п.с. за каждого задетого игрока вам дадут глаза, не важно убьете его вы или другой игрок. Весомой помощью в фарме может стать Жезл дикой маны. Итем увеличивает хп и урон моба, но и существенно умножает количество падающих глаз. Looted 5 from a "Rotten Egg" in the underbelly that I had to kill. Only use I have seen thus far has been bribing the guards in the underbelly which I assume allows PvP combat down there. ...or turn it into a PvP free-for-all! 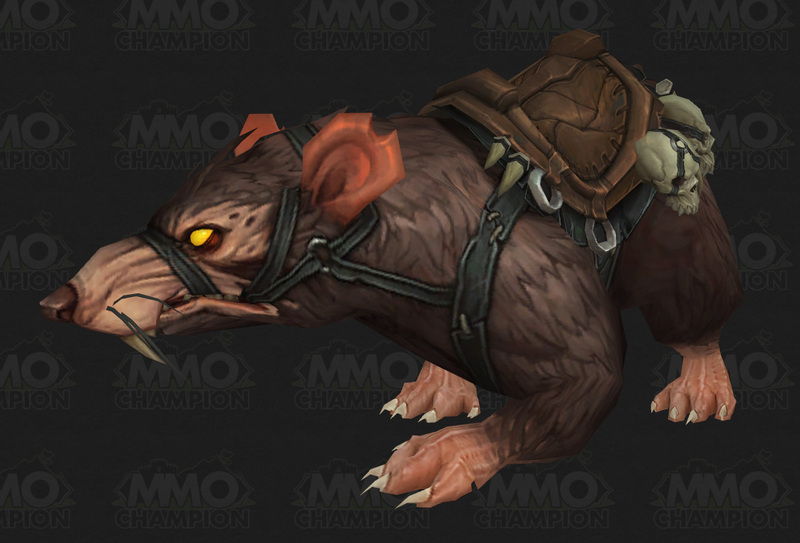 Seeing them adding the Dalaran currency, do you think the Rat Mount can be associated with this? If the currency stacks up to 1k, and sewers are known for PvP. Could it also be the new "bloodied coin" farm? It might not have anything to do with PvP at all. However, most of you might remember fishing up your Giant Sewer Rat right? Im sure we all have our ideas and thoughts of where to get our hands on this thing! There's an achievement associated to looting 20,000 of these (Невиданный урожай). Which awards you with Крысоконь. You can also get these from Мэттью Рэбис by turning in these Прекрасная свеча из ушной серы. You can obtain Прекрасная свеча из ушной серы from Кудесник Маргосс by fishing up 25 Утопленная мана. The Незрячий глаз is a PvP-related currency that is earned and spent in the Dalaran sewers. It can be used for a variety of merchandise. Guards are active whenever you have the Стража канализации debuff. However, by talking to Ретан, the less-than-savoury Underbelly Guard Captain, you can bribe him into calling back his guards and making the area a PvP free-for-all area for a short period of time. Doing so costs 50 Незрячий глаз. Note that the area near the entrance to the sewers (including where Ретан is standing) is a "staging" area and is a sanctuary like the rest of Dalaran - only when you go beyond this area do you enter the free-for-all area, and become flagged. Returning to the staging area will make you unattackable while you remain there, but only after a 7-8 second delay. Guards are inactive whenever you have the Без стражи debuff. That being said, anyone can opt out of getting pummeled by random players by hiring a personal bodyguard from Ретан (he runs quite the racket!). Doing so costs 5 gold, and gives you the Нанятый страж buff for 5 minutes*. When wandering through the sewers with your bodyguard, you cannot attack or be attacked by other players. Note that this buff cannot be cancelled manually by right-clicking. Leaving the Dalaran Sewer area prematurely will cancel the buff, however. The 5-minute timer for your guard to take off is not shown on yourself - however, the guard following you will show the countdown buff when you target him/her. Note that the Underbelly is the new home of the Black Market Auction House and Мадам Гойя. It is located in the large northeastern hexagonal room on the map of the Underbelly. There are a number of ways to acquire this currency. Although it is loosely PvP-related (as Dalaran Sewers is often a PvP area) there is no PvP strictly required to obtain it, although killing players will increase your Незрячий глаз earnings. The most lucrative activities require that you do not hire a bodyguard - and thus may be flagged for PvP combat. Note that you do not lose Незрячий глазs when you die (either to mobs or other players); once you earn it, it stays with you. Once you loot 20,000 Незрячий глазs, you obtain the achievement Невиданный урожай, which rewards the Крысоконь mount. This total is irrespective of when or how you spend the currency - simply looting that amount (total) will unlock the achievement (i.e. you don't need 20,000 at once!). There are various items that, when purchased for Незрячий глаз and used by one person, will summon numerous mobs around the sewers that anyone can engage. When killed, these mobs drop Незрячий глазs (1-10 each). These mobs can be engaged even when a hired bodyguard is active. Killing other players while the Без стражи debuff is active will net you anywhere from 15 to 50 Незрячий глазs per kill. Note that you will not receive any Незрячий глазs from kills if in a raid group when doing so. There are a number of mini-bosses that spawn randomly, and drop 50-90 Незрячий глаз. Some of these need to be tanked, but others don't hit hard at all and don't need to be. The bosses spawn fairly frequently, and at peak times there can be sometimes more than one active (and they can spawn back-to-back) – but they only spawn when the guards are at their post (i.e. free-for-all PvP is not active). These bosses can be engaged even when a hired bodyguard is active. Note that the item Жезл дикой маны can be purchased from Дэззик "Праудмур" for 175 Незрячий глазs and used on any of these bosses. This wand will increase the health of the boss by 200% and damage dealt by 50%, but will also double the number of Незрячий глазs it drops (roughly 100-180). Безумный маг - A fire mage; health scales. Кусака - A large rat - by far the most commonly spawning boss mob. Has about 15.5 million health at baseline, with scaling health. Clearly a reference to Splinter, a character from Teenage Mutant Ninja Turtles! Chests will spawn throughout the Sewers, and can be looted (with a fairly long cast bar, which is longer the bigger the chest) and yield either 10 (Small Chest), 40 (Medium Chest) or 100 Незрячий глазs (Large Chest) each. These chests CANNOT be opened when a hired bodyguard is active. As these are such a quick way to get this currency, and you MUST be flagged for free-for-all combat to loot them, these chests can be hotly contested (similar to the Darkmoon Deathmatch). Defeating Слепая крыса pets in the Underbelly in a pet battle will reward 75 Незрячий глазs. Note that this pet, required for Сафари на Расколотых островах, only spawns in the Dalaran sewers. Pools spawn occasionally in the waters around the Black Market Auction House called Swirling Whorls, which can be fished from to directly obtain Незрячий глазs. A Fishing skill of 1+ is sufficient for this. Additionally, the item Измельченная приманка Скверны can be purchased for 350 Незрячий глаз from Оксана Истребительница Демонов. Using it will spawn pools in the Black Market area, which yield Раздутый пожиратель стоков when fished. These contain 3-5 Незрячий глазs each. Typically, fishing from Swirling Whorls directly earn you more Незрячий глазs, so this item is not the best investment! Every so often a quest will appear in the Underbelly - Experimental Potion: Test Subjects Needed. These are available from Физзи Больная Печень at in the Underbelly. Completing the quest grants 150 Незрячий глаз, plus puts a transformation buff on you that turns you into another creature (Kobold, Skrog, Dryad, etc.) and gives you some kind of new ability or passive while in the Underbelly. The buff persists outside of the Underbelly, but the special abilites only apply there. This quest is not marked as a daily, but will sometimes appear multiple times a day. Below is a summary of the items you can purchase for Незрячий глазs (from various vendors throughout the Dalaran Underbelly). It is possible to interact with and purchase from these vendors with a hired bodyguard active. A reference to the Teenage Mutant Ninja Turtles. This item will spawn 4 wild Молодая боевая черепаха-мутант battle-pets that can be battled and captured. Note that only 4 will spawn, and other people can engage them in combat! Aquatic Battle-pet - Медуза канализационных труб. Is cageable, and can be bought or sold on the Auction House. Using this item will setup a crate of Ratstallion harnesses near Ретан at the southeast entrance of the sewers - this location is fixed, regardless of where in the Dalaran Underbelly you use the item. The next 25 people that click the crate get a Упряжь крысоконя. Like any conjured item, this will remain in your bags until you have logged out for 15 minutes. Now, there is an even BIGGER area for Player vs. Players ... there's an area also on the Broken Isle for players who love to slay off other players... so why the Dalaran Sewers, too? Got 75 eyes for winning a pet battle against a Blind Rat. So pet battles also will reward this currency it seems. I'm currently fishing these up from the pools near the black market at a rate of about 14-16 eyes per minute on average when no one else is fishing here. This means that if I were able to do this uninterrupted, it would take about 24 hours of fishing in order to get the 20,000 needed for the Underbelly Tycoon achievement and Ratstallion mount. 5-9 eyes per catch will drop from the pools, so you may find that your rate is faster or slower depending on a variety of factors such as your ability to consistently aim at the pools, the amount of time before the bobber goes off, and good old-fashioned RNG. Most of the time, pools disappear after a single catch, but sometimes you'll be able to fish from the same pool twice. It's pretty empty in the early hours of the morning, so I've had a lot of time to fish with very few interruptions. The pools spawn constantly, so there's never any waiting around for another one to spawn when you're by yourself. When someone does come to fish out of the pools, it's usually just to grab an Emblem of Margoss, after which they teleport out and leave me to my work. I'm doing this on a level 61 character, which has some pros and cons. When the guards go on break, everyone seems to ignore me because I'm no real threat. I can't even open the chests, so there's no reason to bother with me. Occasionally someone will one-shot me, but I've never been camped. Except for that one time. The only other downside to fishing these up as a low level character is that when Segacedi spawns, he aggros me through the floor, which causes me to be unable to fish except in the brief moment when he times out and resets. Luckily, most people are very quick to kill him, but there was an instance when he was there for about 15 minutes. While this certainly isn't the fastest or most fun method to getting these items, it's definitely a feasible alternative to fighting monsters and other players. I'm really happy that Blizzard consistently makes fishing a relevant and rewarding profession for those of us who enjoy it. The easiest way to have a good time farming these if you're a PVE scrub like me is to hop into Group Finder and grab a spot in a big rat farming group. I earned 1500 eyes in just under an hour of pretty lazy farming in a group of roughly 30 people. Just keep spamming your AOE attacks for kill credit and the eyes pile up. Remember to keep buying items from NPCs, because you have a limited amount of eyes that you can carry at once (5000). You don't need to have 20,000 eyes in your currency tab, you just need to have at some point looted 20,000 total in order to qualify for the mount. The achievement tracks how many you have collected for you. While in a raid group, you will not receive sightless eyes from killing other players. You're stuck with the NPC mobs and bosses, and the chests if you're quick enough. Fishing open water in the Underbelly with Экспериментальное зелье will yield 3-17 Незрячий глаз with an average of 10.09 per cast (over 45 casts, so probably not a great sample size). Given that this buff is one of six random effects from Физзи Больная Печень's 'Experimental Potion' quests and only lasts for 20 minutes, it's not exactly a reliable means of acquisition, but since you'll want to do her quests any time one is available anyway, it doesn't hurt to know the benefit. As of September 18, the transformation quest has been reappearing for me with every relog, prompting me to spam log in Fizzi's room and receive thousands of Eyes in the course of minutes. Hard to imagine this isn't a bug. This is the second-most useless currency in the entire game, behind the Lesser Charm of Good Fortune, if your professions are NOT crafting. My main is a miner/herbalist, and I can't buy anything useful with the Sightless Eye since they removed that possibility in the 7.0.3 patch. If it wasn't for the pet and the box of turtles, this currency would serve NO purpose. First of all. Think the fastest way to get 20k these is boost up bosses and fish the eyes from pools. Mostly annoying thing are ppl who take guards of while others are fighting bosses. Luckily they are likely more or less random so you can get sometimes pretty good streak. No point of camping those chests as they give exact same amount of eye's than boosted boss. What to do with all those sightless eyes? I'm at the limit and don't know how to get rid of them in a useful way. as other comments read the materials got removed from vendor. Is there a way to track how many Sightless Eye you've accrued on your character? I'd like to be able to see how many I have collected so far and how many I have left to go.. is there a macro for this or anything? Obviously, with me spending it on items as I go to speed up mob spawns etc, I kinda lost track of my progress..
Ugh, locking content behind pvp was one of their worst decisions in legion. Примитивная, вручную отчеканенная монета. На ней изображен символ, похожий на знак Кирин-Тора, но с одним отличием: глаз закрыт.